While Botox® has garnered a lot of attention for its cosmetic effects, it also has valuable therapeutic uses. The specialists at Lakemoor Dental are highly trained in administering Botox for dental patients suffering from chronic migraine headaches, gummy smiles, temporomandibular joint (TMJ) issues, tooth grinding (bruxism), and more. The Lakemoor Dental team is thrilled to offer this service to patients in addition to our top-of-the-line cosmetic, restorative, and preventive dental treatments. If you’re wondering about how dental Botox works—and if this treatment is right for you—see the below commonly asked questions or call our office to learn more. How does it treat migraines? How does it treat TMJ? How does it treat gummy smiles? Where is it injected, and what does it feel like? How often will I need Botox treatment? Will my dental Botox treatment have cosmetic effects? Botox is botulinum, a neurotoxin, in purified protein form. When administered in tiny doses by needle to specific muscle areas, it is able to block the transmitter between motor nerves, reducing muscle contractions for three to six months. This doesn’t cause a loss of sensory in the muscles, but it does allow doctors to relieve pain—and smooth wrinkled skin—by preventing contraction. In 2010, Botox was approved by the Food and Drug Administration to treat chronic migraines. When Botox is injected around pain fibers that cause headaches, it is able to block the chemicals released in pain transmission. Blocking this transmission means that the pain networks in the brain cannot be activated, allowing for migraine relief for three to six months. Doctors have found Botox to relieve headaches with great success. How does Botox treat TMJ? Similar to how Botox is able to treat chronic migraines, it can help patients suffering from TMJ and jaw tension. When injected into facial muscles experiencing soreness and discomfort, Botox will temporarily block the chemical messengers causing the muscles to contract. When the muscles are less contracted, jaw tension is relieved and pain is greatly reduced. How does Botox treat gummy smiles? The team at Lakemoor Dental specializes in perfecting tooth shape and size for our patients—among those conditions affecting tooth shape and size are gummy smiles. Some patients naturally have a thicker gum line, simply caused by a shorter upper lip, smaller teeth, or excessive gum tissue. Botox provides a less invasive option for patients looking to improve the appearance of a gummy smile. By injecting Botox in the upper lip, the muscles of the face and upper lip will relax and help reduce its appearance. Where is Botox injected, and what does it feel like? Botox will be injected in the musculature associated with your specific pain, such as around the eyes to treat chronic migraines. At your appointment, your specialist will use a very small needle to inject small amounts of Botox into the shallow muscles of the skin. The injections will feel like pinpricks—patients typically don’t experience pain—and only take minutes to complete. 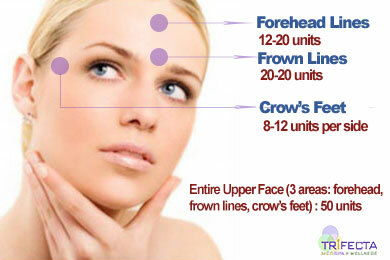 The frequency of Botox treatment depends on each patient’s unique body and how quickly the muscles adjusts to treatment. Typically, patients will return every three to six months for another treatment. However, as the patient continues to receive Botox treatment, the time between treatments becomes longer and longer as the patient’s muscle tone changes over time. Anyone 18 years or older can receive Botox at the Lakemoor Dental offices if they are suffering from chronic migraine headaches, gummy smiles, TMJ issues, tooth grinding (bruxism), or other conditions which can benefit from the treatment. Patients receiving Botox treatment can do so it their routine dental check-up appointment—it will only take a few minutes at the end. If you’re interested in receiving dental Botox for therapeutic purposes, call our office. We’ll answer all your questions and develop a plan to relieve you of pain, leaving you feeling confident in your smile. While dental Botox is administered to therapeutically address issues such as chronic migraine headaches, gummy smiles, temporomandibular joint (TMJ) issues, and tooth grinding (bruxism), a lot of the injection points for these muscles also impart cosmetic effects. Our patients receiving dental Botox treatment enjoy cosmetic benefits associated with the mouth and face while alleviating painful symptoms.